Disclosed is a method for identifying the presence of target gene mRNA by hybridizing the target gene mRNA expressed in a tissue sample with at least one oligonucleic acid probe and detecting a low-molecular-weight compound label added to at least one nucleotide in the oligonucleic acid probe. In the method, the tissue sample is pretreated with at least one dummy oligonucleic acid (prehybridization), and subsequently the oligonucleic acid probe is contacted with the tissue sample to hybridize the oligonucleic acid probe with the target gene mRNA, or alternatively, a mixed solution of the oligonucleic acid probe and the dummy oligonucleic acid is contacted with the tissue sample to hybridize the oligonucleic acid probe with the target gene mRNA. The dummy oligonucleic acid has almost the same length as that of the oligonucleic acid probe. The dummy oligonucleic acid cannot hybridize with a region on the target gene mRNA with which the oligonucleic acid probe can hybridize, and cannot hybridize with the oligonucleic acid probe. The present invention relates to RNA in situ hybridization can be conveniently detected and quantified pathological and histochemical gene expression, used for research and diagnosis. (1) RNA in situ hybridization pathological, histochemically method for detecting the gene expression are known some. Among them, the messenger RNA (mRNA) gene is a transcript Deki transferred, as a method for (in situ) detected in situ mRNA is present, it is in situ hybridization method. This method, hybridizing a nucleic acid probe to the mRNA by addition of the detected desired mRNA sequence buffer for in situ hybridization with nucleic acid probes were dissolved with a complementary nucleic acid sequence of (Patent Document 1) in tissue samples to soybean. In this case, the nucleic acid probe is added label for detection, to detect the label in a suitable manner, observed under a microscope (Patent Document 2). Often, digoxigenin (Dig, digoxigenin) it is used as a label, using the protein of the alkaline phosphatase anti-digoxigenin antibody conjugated to detect the Dig label at the anti-digoxigenin antibody portion, further alkaline phosphatase-NBT / BCIP color reaction to cause a, sensitized by (Patent Document 3, 4, 5 and 6). The nucleic acid probes, have oligo DNA (Patent Documents 7 and 8) or oligo RNA has been used to sequence the entire length or a portion of the mRNA to be detected complementary RNA obtained by transcription in an in vitro transcription system or by chemical synthesis, It was. Such in situ hybridization method, the first paper since it was published by Pardue and Gall (Non-Patent Document 1) and John et al. (Non-Patent Document 2), it passed 40 years a little less than. Original label is used radioactive radioisotopes were used to detect the presence of mRNA and exposed it to the film. Thereafter, as a non-radioisotope techniques (Patent Document 9), such as those described above Dig label technique has been developed (Patent Documents 3, 4, 5 and 6). In addition to the color development reaction with the alkaline phosphatase-NBT / BCIP as a sensitizing method, a tyramide sensitization (TSA sensitization) has been developed, used to increase detection sensitivity (Patent Documents 10, 11, 12 ), also detected using fluorescent dyes have been developed (non-Patent Document 3, Patent Document 13, 14, 15). (2) as a nucleic acid probe to mRNA to be a nucleic acid probe detection, when using complementary RNA obtained by transcription in an in vitro transcription system, by incorporating Dig-UTP in vitro transcription system, complementary transcribed synthesized RNA to thereby incorporate Dig-UTP put Dig label (Patent Document 3, 4, 5 and 6), any number of Dig-UTP into individual complementary RNA probe molecules are captured and what in the probe sequence or incorporated into position, it can not be artificially controlled. In the case of using a complementary RNA as a probe, in order to obtain a strong signal, synthesizing the possible long complementary RNA in in vitro transcription system, the length hydrolysis is fragmented about 500 bases from the 300 bases create a probe has been used. In this case, where not be artificially controlled locations that either hydrolyzed the mixed probes of various fragments. To avoid mixing of the various fragments, from the mRNA full length target, high length characteristics as other genes selected one in the computer the region of about 500 bases from the 300 bases, in the region after cloning create a complementary RNA probes in vitro transcription system, there is a case of performing RNA in situ hybridization with a probe one. However, during the cloning and in the selection area, the length of the probe from the limitations on the GC content, an important parameter during constraint or hybridization at both ends sequences of this region as a PCR primer for each between the genes is mixed . Furthermore, there is a disadvantage that extra sequences such as vector used for 3 'end of the complementary RNA, in addition to the selected region is added in the in vitro transcription system. Thus, when using a complementary RNA as the probe using an in vitro transcription system, a mixed length for each probe, since the positions and the number of labels to be added also uncontrolled, mRNA expressing the inability to provide quantitative properties to a probe used for detection for quantifying, there is a disadvantage that. Especially for the purpose of comparison of the expression levels of between multiple genes, for conditions for hybridization between the probe to be used is different, the conventional complementary RNA probes are not suitable. Further, when using complementary RNA as a nucleic acid probe involves difficulties in the experimental condition setting. That is, the hybridization process is a type of equilibrium reaction, is necessary to search the temperature at which to concentration conditions and hybridization probes which hybridize to as many mRNA molecules nucleic acid probes for the purpose of increasing the detection sensitivity There, it varies depending on the length and GC content of the complementary RNA probe used. In the process for detecting the hybridized complementary RNA probe, for even antibody reaction to detect the label is an equilibrium reaction, either the antibody concentration to much, condition search is required. Furthermore, due to the increased color intensity sensitizing be dependent on the reaction time, such as chromogenic reaction with alkaline phosphatase, it is necessary to control the reaction time. As described above, when using the complementary RNA created in an in vitro transcription system as a nucleic acid probe, it is not simple and requires complex processes and conditional searches. Recently, the use of chemically synthesized oligo-nucleic acid such as DNA synthesizer as a probe, has come to be attempted. This is without cloning mRNA, presumably because that allows easy probe prepared based on the nucleic acid sequence registered in the database. Furthermore, there is an advantage that sequences better permeability to tissue samples than from shorter for 300 bases to 500 bases in length complementary RNA probe. On the other hand, compared to a complementary RNA probe, fewer of which labels attached per probe molecule is short oligo nucleic acid probe length, thus to detect the hybridized oligo nucleic acid, that the signal strength is weak there is a drawback. To overcome this drawback, large have been tried two directions. One is bright as the label molecule of the oligonucleic acid probes, using a fluorescent molecule such as Cy3 and fluorescein, a weak fluorescence emitted from fluorescent molecules label using the 100 times higher magnification objective 60 times the number of Optical section image in the Z-axis direction taken as a point, recorded using a CCD camera, a method of observing by sharpening the image using a computer algorithm (Patent Document 13). To process computer can measure the luminance in one pixel, it is possible to quantify the mRNA. In this case, in order to earn signal strength, it has been attempted to increase the number of labels molecules to be added to the probe by releasing the inter-base label molecule is added 10 bases or more. Furthermore, the mRNA to be detected by developing this method, where the mRNA using a probe obtained by color-coded in a plurality of fluorescent molecules are transcribed, the method of detecting have been developed (Patent Documents 14, 15 ). Another direction, and techniques to increase the number of labels molecules to be added with a tail (tail) on the outside of the target mRNA sequence complementary probe molecules, sensitization method called TSA (tyramide sensitivity amplification) (Patent due literature 10, 11, 12), a method of sensitized signal detection and observation. The alkali Fast file hydratase-NBT / BCIP chromogenic sensitization and TSA sensitization method using, tend to background noise is increased by the sensitization, although the intensity of expression are qualitatively microscopy, quantification of mRNA levels not reached before. Further, in the same tissue samples, it does not reach the to onset of comparison between mRNA of multiple genes. US Patent No. 5750340 U. S. Patent No. 4,888,278 Japanese Patent No. 1999884 U. S. Patent No. 5344757 U. S. Patent No. 5354657 US Patent No. 5702888 US Patent No. 5597692 US Patent No. 6265156 US Patent No. 5,985,549 US Patent No. 5196306 US Patent No. 5,583001 US Patent No. 5,731158 US Patent No. 5,866,331 US Patent No. 6,534,266 JP-T 2002-542793 ... Pardue ML, and Gall JG (1969) Molecular hybridization of radioactive DNA to the DNA of cytological preparations Proc Natl Acad Sci U S A. 1969 Oct; 64 (2): 600-4 John et al (1969) RNA-DNA . hybrids at the cytological level Nature 1969 Aug 9; 223 (5206):.. 582-7 Levsky JM, and Singer RH, Fluorescence in situ hybridization: past, present and future J. Cell Science, 116, 2833-2838, 2003 . The quantification of mRNA expressed, quantified properties PCR method is used. However, breaking the construction of tissue homogenized tissue in quantitative property PCR, for the use of various cell-derived mRNA present in the tissue was mixed sample, quantification of mRNA expressed in individual cells Can not. Therefore, if quantify the amount of mRNA expressed histochemically in addition to localization enables quantification of mRNA expressed in a variety of cells in tissue, the application of the science and industry spread. For example, the cancer tissue a mix of normal and cancer cells, more in normal cells co-exist various ones. In many cases the cancer tissues, low high cancer cells and differentiation of differentiated cancer cells are mixed. In cancer cells such cancer tissues, by detecting and quantifying the histochemically expressed that mRNA, if it possible to diagnose the response of anti-cancer agents, a significant effect in terms of cancer chemotherapy expectations it can. There are RNA in situ hybridization method as a method for detecting the localization of mRNA in histochemical tissue samples. Conventionally, in many cases as RNA in situ hybridization method, the complementary RNA created in an in vitro transcription system has been used as a probe. However, the complementary RNA probe, histological pathology the presence of mRNA to be detected (localization), histochemically even be detected, exactly how much mRNA amount whether present therein, to quantify not suitable for. In the case of using the oligo DNA probe labeled with a fluorescent molecule, although it is possible quantification of mRNA expressed by measuring with a computer fluorescence intensity, 100 times 60 times for detection of fluorescent signal it is necessary to use a high magnification of the objective lens. Therefore, the detectable range is very narrow in a tissue sample, normal pathological that using 40 × objective lens from 10 times to diagnose for a wide range of tissue samples, when taking a histochemical methodology, the presence of mRNA for the detection of difficulties. Furthermore, it is necessary to imaging in many Optical section in the Z-axis direction using an expensive microscope, to sharpen the image using a special computer algorithm, the detection of mRNA is not easy. On the other hand, in the case of using the sensitizing methods such as TSA sensitization to detect mRNA in tissue samples using 40 × objective lens to 10 times, the background noise not only target signals may be simultaneously amplified signals - noise ratio (SN ratio) is poor, quantification of mRNA is difficult. Normally, when performing RNA in situ hybridization, in order to reduce the background noise, such as fish (mainly salmon) sperm DNA or yeast tRNA is used. Because the tissue sample is a biological sample, site biopolymers and molecular characteristics are equivalent nucleic acid probes non-specifically adsorbed are present numerous in tissue samples. Adsorbed nucleic acid probes nonspecifically tissue sample cause background noise. Especially when sensitized signal by sensitization methods, background noise is also amplified at the same time, leading to deterioration of the SN ratio. To prevent non-specific adsorption to a tissue sample of the nucleic acid probe, the fish sperm DNA or yeast tRNA single-stranded fragmented enough length 2000 bases by sonication prior to hybridize the nucleic acid probes in if adsorbed on the non-specific adsorption sites by using for the prehybridized, can lower the background noise. Alternatively fish sperm DNA or yeast tRNA is used by the nucleic acid probe and mix in the hybridization solution. However, when using the oligo nucleic acid probes, the use of length 2000 base as single-stranded fragmented fish sperm DNA, the possibility of sites oligo nucleic acid probe to fish sperm DNA hybridize exists is there. By this site to compete with the original target mRNA in a tissue sample, it hampers when oligo nucleic acid probes hybridize to the target mRNA, which may cause to reduce the original signal. Alternatively oligo nucleic acid probe hybridized to the fish sperm DNA is cause background noise, the noise is amplified by sensitization. Further, the oligo nucleic acid probes, even when fish sperm DNA is fragmented enough length 2000 bases shorter than the fish sperm DNA, due to the high permeability to tissue samples, fish tissue samples may nonspecific adsorption sites sperm DNA can not reach are present, this may cause to increase the background noise. The present invention was made in view of the above problems, by amplifying the signal to lower the background noise, using 40 × objective lens to 10 times, depending on the expression level of mRNA signal by accurately and easily detect a change in intensity, it detected and quantified the mRNA pathological and histochemical expression is an object to provide means for utilizing the study and diagnosis. The present inventors, not the fish sperm DNA, such as normal salmon used in RNA in situ Hybridization, dummy oligo nucleic acid of the oligo nucleic acid probes substantially identical length, in order to prevent non-specific adsorption to a tissue sample oligo nucleic acid probe the use, in the case of using the sensitizing methods, found that there is simply image capturing, the improvement of the SN ratio and the signal enhancement by the CCD camera using a 20 × objective lens to 10 times with a fluorescence microscope It was. Then, assuming the use of the dummy oligonucleic acid, the signal intensity observed as the number increases labels oligonucleic acid probes has been found that increased additively. Furthermore, upon detecting the expression mRNA of a single gene, according to the sequence number of types of attached oligo nucleic acid probes of the same number of labels increases, the signal intensity observed was found that increased additively. Furthermore, according to GC content in the oligonucleic acid probe sequences increases, the signal intensity observed was found that increasing increasing function manner. Further, according to the Tm value of the probe is increased, the signal intensity observed was found that increasing increasing function manner. The present invention is based on the new findings described above by the present inventors, to provide the following. RNA in situ hybridization method characterized by. (2) dummy oligo nucleic weight, RNA in situ hybridization method of (1) 2 to 10 times the oligo nucleic acid probe amount. (3) RNA in situ hybridization method of (2) is substantially the same base length oligo nucleic acid probe and the dummy oligonucleic acid in a range of 70bp from 20 bp. (4) oligo nucleic acid probes, the 5 'end base and / or 3' RNA in situ hybridization method of the low-molecular compound labels the respective end bases are added (1). (5) RNA in situ high of the two or more oligo nucleic acid probes described in (4), hybridizes to mRNA such that the 5 'and 3' ends to each other away 8 or more bases (1) hybridization method. (6) an antibody against a low-molecular compound, an enzyme conjugated to the antibody, sensitized the detection signal using the chromogenic compound or a fluorescent molecule compound as a substrate for this enzyme, using 40 × objective lens to 10 times RNA in situ hybridization method of the detecting the signal (1). (7) a tissue sample isolated from mammal tissues, RNA in situ hybridization method of (1) a oligo nucleic acid dummy oligo nucleic acid corresponds to a part of the repeated sequences of retrotransposon. (8) a tissue sample isolated from mammal tissues, RNA in situ hybridization method of (1) dummy oligo nucleic acid is an oligonucleotide nucleic acid corresponding to a portion of some or microbial genome of a plant genome. RNA in situ hybridization method of (1) a oligo nucleic acids obtained by. (10) a dummy oligo nucleic acid for use in RNA in situ hybridization method described in (7), oligo-nucleic acid comprises a portion sequence of repeated sequences of retrotransposon or from different part sequence of the repeat sequence, set of a plurality of types of oligo nucleic acid of. (11) the (8) to a dummy oligo nucleic acid for use in RNA in situ hybridization method described, each oligo nucleic acid or a plant genome or a microorganism genome, consisting of some sequences of some or microbial genome of a plant genome set of multiple kinds of oligo nucleic acid consisting of different partial sequence. The present invention as described above, it is possible to detect and quantify conveniently and highly accurately the mRNA pathological and histochemical expression progress basic research on the cause and treatment of various diseases It is, or contributes significantly to the improvement of diagnostic accuracy of various diseases. In Example 1, the results of RNA in situ hybridization was determined optimum addition ratio oligo DNA probe concentration of dummy oligo DNA. In Example 1, for determining the optimum addition ratio oligo DNA probe concentration of dummy oligo DNA, which is the result of obtaining the signal intensity in each addition ratio from the result of RNA in situ hybridization. In Example 1, for determining the optimum addition ratio oligo DNA probe concentration of dummy oligo DNA, the 1-fold addition ratio and 8 times a result of obtaining the signal intensity at each probe concentration. In Example 2, there are two types, salmon sperm DNA, and RNA in situ hybridization results obtained an effect for each oligo DNA probe concentration in the case of no addition of the dummy oligo DNA. In Example 2, two dummy oligo DNA, to determine the effect of each oligo DNA probe concentration in the case of salmon sperm DNA, and no addition, from the result of RNA in situ hybridization, when a probe concentration of 0nM signal strength is a result of calculating. In Example 2, two dummy oligo DNA, to determine the effect of each oligo DNA probe concentration in the case of salmon sperm DNA, and no addition, from the result of RNA in situ hybridization, signals at the computed each probe concentration was it is a strength. In Example 3, the results of the comparison of the effects in RNA in situ hybridization of an RNA detection dummy oligo DNA and salmon sperm DNA. In Example 3, it is shown on the vertical axis the SN ratio obtained, the horizontal axis of the probe concentration, the comparison of the SN ratio of the case of adding the SN ratio and salmon sperm DNA in the case of adding dummy oligo DNA. In Example 4, the results of RNA in situ hybridization was performed by changing the type and number of dummy oligo DNA sequences to be used. In Example 4, the results of obtaining the effect of each dummy oligo DNA as a signal intensity from the results of RNA in situ hybridization to determine the effect of various dummy oligo DNA. In Example 5, a photograph in RNA in situ hybridization showing the relationship between the signal intensity detected with the number of types of probes used for the detection. It is a correlation between the number of types of signal intensity and probe in Example 5. In Example 6, a photograph image obtained by imaging or signal intensity how to vary according to the concentration of probe used to detect increases. It is the correlation between signal intensity and probe concentration in Example 6. It is the correlation between signal intensity and probe concentration in Example 6. In Example 7, the signal intensity according to the concentration of probe increases to be used for detection, a photograph image was examined how the change. It is the correlation between signal intensity and probe concentration in Example 7. In Example 8, the gene Arntl the expression in accordance with circadian cycle varies from 9 am to 1 am every four hours, a photographic image was examined by RNA in situ hybridization for mouse liver. In Example 8, as a result of internal standard gene Actb and the circadian gene Arntl the expression in accordance with the period varies from 9 am to 1 am every four hours, the liver was collected and examined change in the expression level by quantitative PCR it is. In Example 8, 9 AM for gene Arntl 1:00 midnight every four hours, we examined the expression changes in liver RNA in situ hybridization, a result of determining the change in signal intensity. In Example 8, 9 AM for gene Arntl 1:00 midnight every four hours, the change in expression in the liver, examined by quantitative PCR and RNA in situ hybridization, the correlation results of the results and the signal intensity of the quantitative PCR is a view taken. In Example 9, the expression in the liver for gene Cyp1a2 and Alb, a photographic image obtained by performing the RNA in situ hybridization at the same time using a plurality of oligo DNA probes. In Example 10, the results of examining the effect of the concentration of a tyramide-Flu in a tyramide sensitivity Amplification. In Example 11, an example of calculation of the GC content of each oligo nucleic acid (%). The results in Example 12, the effect and the number of the effect of the position (5 'or 3' end) to label oligo nucleic acid probe was confirmed by the signal intensity of in situ hybridization to the rat actin beta gene Actb in rat lungs it is. In Example 13, on the mRNA of a single gene, when trying to detect a hybridized product using more than one label on the mRNA of the nucleic acid sequence, the two labels must have exactly away much or is a conceptual view of two oligo DNA probes to confirm. In Example 13, on the mRNA of a single gene, when trying to detect a hybridized product using more than one label on the mRNA of the nucleic acid sequence, the two labels must have exactly away much is the result of RNA in situ hybridization was performed in order to confirm whether. In Example 14, that is the result of in situ hybridization with oligo nucleic acid probes of varying GC contents. (1) comprises, said the oligo nucleic acid probe on the target gene mRNA is not hybridize to the hybridizing region, also the use of one or more dummy oligonucleic acids do not hybridize with oligo nucleic acid probe to. Or specifically, to a dummy oligo single-stranded nucleic acid is one of the oligo nucleic acid probe is brought into contact with the tissue sample target gene mRNA hybridized strands after being pretreated (prehybridized) in a tissue sample, or the mixture of the dummy oligo nucleic acid of the oligo nucleic acid probe and a single strand of single-stranded in contact with the tissue sample to hybridize the oligonucleic acid probes of single stranded target gene mRNA with. Incidentally, the target gene is one to 10 or about gene mRNA that is expressed in a tissue sample. The dummy oligo nucleic acid can oligo nucleic acid probe on the target gene mRNA is not hybridize to the hybridizing region, also produced by chemical synthesis on a condition that does not hybridize with the oligonucleic acid probes. The chemical synthesis, commercially available automatic DNA synthesizers can also be used. In addition, it is also possible to use DNA synthesis trustee. The region where the dummy oligo nucleic acid oligo nucleic acid probe on the target gene mRNA to hybridize with conditions that do not hybridize, the target gene mRNA that hybridizes to oligo nucleic acid probe is synonymous with having a different base sequence. This is different from the base sequence of a case, for example, 30% concordance rate in the nucleotide sequence comparisons, such as Blast or less, preferably 20% or less, more preferably to a reference 10% or less. Alternatively, more than 70% of the total length of the oligo nucleic acid probes, preferably 80% or more, more preferably may be a reference to that contiguous nucleotide sequence corresponding to more than 90% are different sequences. The condition that the dummy oligonucleic acids do not oligonucleic acid probes hybridize, with complementary sequence of the oligonucleic acid probes, for example, match rate is 30% or less in the nucleotide sequence comparisons, such as Blast, preferably 20% or less, more preferably 10% it can be used as the reference or less. Alternatively, more than 70% of the total length of the complementary sequence of the oligonucleic acid probes, preferably 80% or more, more preferably may be a reference to that contiguous nucleotide sequence corresponding to more than 90% are different sequences. Types of the dummy oligo nucleic acid may be well in one or more (2-5 kinds). In the case of using a plurality of types of dummy oligo nucleic acid, two of which may have a sequence complementary to each other. The dummy oligonucleic acid amount, i.e. the concentration in the prehybridization solution or a hybridization solution described later, an oligo nucleic acid probe volume, i.e. 2-10 times the concentration of the oligo nucleic acid probe in the hybridization solution, preferably 6 to 8 times it can be. When using multiple oligo nucleic acid probe, the sum of their concentrations and oligo nucleic acid probe amount. You may use multiple dummy oligo nucleic acid, to the sum of their concentrations between dummy oligo nucleic acid amount. Further, the length of the dummy oligo nucleic acid is substantially the same as the length of the oligo nucleic acid probe. This substantially the identical case, both the length difference ± 10%, preferably ± 5%, even more preferably ± 3%, particularly preferably refers to the range of ± 0% (completely the same). Base long oligonucleotide nucleic acid probe can be in the range of 70bp from 20 bp, therefore, the base length of the dummy oligonucleic acid also becomes oligo nucleic acid probes substantially identical length in this range. Such dummy oligo nucleic acid, but does not hybridize to the target gene mRNA can be selected nucleic acid sequence that hybridizes to the mRNA of other genes. It is also possible from the repeat sequences of retrotransposon origin appearing repeatedly in mammalian genome oligo nucleic acid probe and the length is selected as approximately the same sequence. Furthermore, it is also possible to select a substantially identical sequence length from sequence of a gene not present in mammals in plants and microorganisms. Selection of the dummy oligo nucleic acid, the sequence of the gene repeat sequence and plants and microorganisms in the genome to be selected dummy oligo nucleic acid, 5 while shifting from the 'side-by-base simple GC content in the partial sequence of the desired length can be calculated by computer programs, it is possible to list an oligo nucleic acid sequences having the desired GC content. By multiplying the listed oligos arranged in blast search then it is confirmed degree of coincidence between the oligo nucleic acid probes, to select one low matching degree oligo nucleic acid probe. During Blast search, because they are retrieved simultaneously for the complementary strand, having a low degree of coincidence with the complementary strand of oligo nucleic acid probes are simultaneously selected. The dummy oligonucleic acid also of the base sequence of oligo nucleic acid probes, sequentially from example 5 'side, the A to T, T to A, replacing the G and C, and a C to G, the same base M (M is 4) when continuously at least a substituted its base M × 0.2 sites in continuous sequence M × 0.8 locations from (and rounded up integer) (integer devalued decimal) with its complementary base and, if (the N to 5) N base becomes the same sequence read from 'also 3 read from the side' side 5 there are more palindromic sequence is at least N × 0.2 places (integer by rounding up the decimal point), N is most cases an even number (N / 2-1) sites, most when N is an odd number ((N-1) / 2-1) the locations of the base be replaced by its complementary base, obtained by oligo it is also possible to use nucleic acid. GC content of the dummy oligo nucleic acids of this case, the same as the oligo nucleic acid probe in both length. Oligo nucleic acid probe, a low molecular compound label is added to the at least one base. It may also be added to two or more different kinds of low-molecular compounds labels. The low-molecular compound label, for example, a conventional method similar to digoxigenin (Dig, digoxigenin) or can be used FITC (fluorescein isothiocyanate) fluorescence of such dyes (non-patent document 3). For example, when using the Dig, using protein linked alkaline phosphatase anti-digoxigenin antibody to detect the Dig label at the anti-digoxigenin antibody portion, and further cause a chromogenic reaction with alkaline phosphatase-NBT / BCIP, sensitize (Patent Document 3, 4, 5, 6). In addition to the color development reaction with the alkaline phosphatase-NBT / BCIP as a sensitizing method, peroxidase in protein or anti-FITC antibody peroxidase anti-digoxigenin antibody conjugated to take tyramide- fluorescent dye molecules conjugated protein tyramide sensitization sensitized reacted can also be used (TSA sensitization), etc. (Patent documents 10, 11, 12). The addition of the low molecular compound label, one preferred embodiment, a two places of the 5 'end base and the 3' end base of the oligonucleic acid probes. The added oligo nucleic acid of such a label can be ordered oligo DNA synthesis trustee, it is readily synthesized. Oligo nucleic acid probe, one or more for one of the target gene mRNA, i.e. 1-20 species, preferably 1 to 10 species, more preferably hybridizing 1-5 or to different regions of the mRNA. By using such a plurality of kinds of oligo nucleic acid probe, it is possible to shorten the hybridization process time. Furthermore, the concentration of the oligo nucleic acid probe can be in the range of 0.01 nM ~ 10 nM, in particular by increasing the concentration within this range, it is possible to shorten the hybridization process time. Also, when using a plurality of oligo nucleic acid probe, it is preferable GC content between oligo nucleic acid probes are substantially the same. This substantially the identical case, differences ± 10% GC content of the two, preferably ± 5%, even more preferably ± 3%, particularly preferably refers to the range of ± 0% (completely the same). Incidentally, in the case of hybridizing a plurality of kinds of oligo nucleic acid probe having a label at both ends to the target gene mRNA is so where the 5 'and 3' ends of each other of the probe away 8 bases or more. In one preferred embodiment, more than the length of the oligo nucleic acid probe used put a distance between the 5 'and 3' ends of each other of the probe. To the target gene mRNA, when a plurality designing such oligo nucleic acid probe, first, using a simple computer program, the window of the length of the desired oligo nucleic acid probes, one base from the 5 'end of the target gene mRNA while shifting by the GC content was calculated on the window, the window is 3 'candidate probe sequences with the desired GC contents by performing calculations until it reaches the end is easily listed, the listed candidate sequences the use of blast search of NCBI (National Center for Biotechnology Information, USA) to confirm the specificity of the probe sequence can be readily selected complementary strands of highly specific sequence as a sequence of the oligonucleotide nucleic acid probe. Buffer used during the hybridization (hybridization solution) basically can be adopted a solution as described in Patent Document 1. In the present invention, in the final solution, formamide 12.5% ​​~ 25%, 3 × SSPE (Invitrogen Corp.), 1 × Denhardt (Wako Pure Chemical), 10% dextran (V / V) (Sigma Co.), 0.2% CHAPS It was used (Sigma-Aldrich, Inc.)). This generally adding tRNA of yeast or E. coli. The temperature of hybridization is dependent on the length and GC content of the oligo DNA probe used, it is carried out in the range of 45 ° C to 30 ° C. For example, when GC content of 40 bases in length of the oligo DNA probes of 50%, preferably carried out from 40 ° C at 42 ° C. Hybridization time is 24 hours 12 hours, preferably 16 hours. Based on the RNA in situ hybridization method as described above, it is possible to quantitatively detect the target gene mRNA. For example, when a digoxigenin (Dig) as a label, conducted Tyramide- TSA sensitization method with fluorescent dyes with an anti-digoxigenin antibody peroxidase (POD) were conjugated, the tissue samples from the 10-fold 40 times taken with a CCD camera through a fluorescence microscope objective lens, resulting microscopic images image J (NIH, http: //rsb.info.nih.gov/ij/) using image processing software, such as computer by determining the signal intensity of the fluorescent dye is treated, it is possible to easily quantitatively detect the expression level of mRNA of the target gene. Reagents and tyramide- fluorescent molecules for sensitization Tyramide is commercially available from Perkin Elmer Co. and Invitrogen Corp., can use them. Also, antibodies to label molecules POD is conjugate is commercially available from such Dako Corporation and Roche Inc., these can be used. Furthermore, when using an oligo nucleic acid probe obtained by adding two or more labels i as a low molecular compound label, an antibody to the respective labels i the POD is added, multistage using Tyramide- fluorescent dye i to perform a tyramide sensitivity Amplification sensitized fluorescence by multiple detection signals for the dye i, 2 localization or more target genes of mRNA and it is possible to quantitatively detected using fluorescent microscopy. If a low expression level of the target gene, by increasing the concentration of several or oligo nucleic acid probes, oligonucleic acid probes that hybridize to the mRNA of the target gene, it is possible to widen the detection range. If high expression levels of the target gene Conversely, reducing the concentration of the target number of mRNA hybridizing labels the number and probes in oligo nucleic acid probe of the gene, the concentration of the oligo nucleic acid probe or used tyramide- fluorescent dye, Accordingly, it is possible to the same extent as a low-abundance gene mRNA the width of the detection range. This allows for the expression level of different genes of mRNA with an intensity and range width comparable signal localization and quantitative detection can be utilized such as histopathology. Hereinafter, will be described in more detail and specifically to the present invention by showing Examples, the present invention is not limited to the following examples. Incidentally, in the examples, using synthetic oligo nucleic acid consisting of the following nucleotide sequence. SEQ ID NO: 1-4 are the nucleotide sequence of the hybridizing oligonucleotide nucleic each mouse Cyp1a2 gene mRNA. SEQ ID NO: 5, 7 and 8 is the nucleotide sequence of the oligonucleotide nucleic acid consisting of partial sequence of human transposon repeat sequences. SEQ ID NO: 9-11 are the nucleotide sequence of the oligonucleotide nucleic acid consisting of the complementary sequence of SEQ ID NO: 5,7,8. SEQ ID NO: 6 is the nucleotide sequence of the oligonucleotide nucleic acid consisting of a part sequence of Shiroizunazuna POD gene. SEQ ID NO: 12 is the nucleotide sequence of the oligonucleotide nucleic acid that hybridizes to the mouse alb gene mRNA, SEQ ID NO: 13 and 14 is the nucleotide sequence of the oligonucleotide nucleic acid that hybridizes to the mouse Arntl gene mRNA. SEQ ID NO: 15 and 16, a nucleotide sequence of PCR primer set of mice Arntl gene, SEQ ID NO: 17 is the nucleotide sequence of the TaqMan Probe for a mouse Arntl gene. SEQ ID NO: 18 and 19, a nucleotide sequence of a primer set of mouse Cyp1a2 gene, SEQ ID NO: 20 is the nucleotide sequence of the TaqMan Probe for a mouse Cyp1a2 gene. SEQ ID NO: 21 is the nucleotide sequence of a primer set of a mouse Alb gene, SEQ ID NO: 23 is the nucleotide sequence of the TaqMan Probe for a mouse Alb gene. SEQ ID NO: 24-27 are the nucleotide sequence of the hybridizing oligonucleotide nucleic each mouse Cyp1a2 gene mRNA. SEQ ID NO: 28 is the nucleotide sequence of the oligonucleotide nucleic acids that hybridize to a mouse Alb gene mRNA. SEQ ID NO: 29 rat Actb gene mRNA, SEQ ID NO: 30-34 respectively rat Gapdh gene mRNA, SEQ ID NO: 35-37 are the nucleotide sequence of the hybridizing oligonucleotide nucleic each rat Actb gene mRNA. SEQ ID NO: 38, sequentially from the 5 'side of the oligo nucleic acid of SEQ ID NO: 27, A to T, T to A, replacing the G and C, and a C to G, replacing the ATAA a consecutive sequence of TTTT it is a nucleotide sequence of the synthesized oligo nucleic acid and. It was determined optimum addition ratio probe concentration of dummy oligo DNA. Target tissue using a mouse liver was Cyp1a2 gene to be detected. The liver 8-week-old male mouse to create a paraffin blocks by embedding usual formalin fixation and paraffin, to create a continuous thick sections 5 microns, deparaffinized treated with Protease K (Invitrogen, Proteinase K SOL. RNA, 25530049 after) in the process, it was carried out the RNA in situ hybridization. Both ends as probes for detecting mRNA of the gene Cyp1a2 was used FITC labeled four single-stranded oligo DNA probes (SEQ ID NO: 1-4). Cyp1a2 gene mRNA on SEQ ID NO: 1-4 in the are arranged in the direction of 3 'end from the 5' end in numerical order, the distance to the next oligo DNA probes, SEQ ID NO: 1 and 2 594 bases, SEQ ID NO: 2 and 3 16 bases, SEQ ID NO: 3 and 4 is 61 bases. Further, using the dummy oligo DNA (single-stranded) of SEQ ID NO: 5. The detection of the FITC label, Dako Corp., anti-FITC rabbit polyclonal antibody, using P5100, tyramide-FLU (Perkin-Elmer Corp., TSA Plus Fluorescein System, NEL741B001KT) was performed TSA sensitization by. 1, each of the concentrations 1nM of four probes (nanomolar), 2 nM, 3 nM, 4 nM, 5 nM, i.e. each sum 4 nM, 8 nM, 12 nM, 16 nM, to 20 nM, the concentration of the dummy oligo DNA is 1 times, 2-fold, 4-fold, indicating a 6-fold, 8-fold, as a result of the quantitative property RNA in situ hybridization using the hybridization solution was added at 10 times the concentration. Note that when the 0nM as a control experiment, dummy oligo DNA was added 200 nM. Images with a 10 × objective lens, the same region of the serial sections were taken using a Zeiss fluorescence microscope Axioplan2 and a CCD camera AxioCam. These image data Image J software (NIH, http: //rsb.info.nih.gov/ij/) is probe concentration from the signal intensity of each image processing computer with the subtracted signal intensity when the 0nM the value was determined as the signal intensity of each image. Figure 2 is the result, taken as the relationship between the signal intensity obtained by detecting the addition ratio and Cyp1a2 gene mRNA of dummy oligo DNA, the addition ratio of dummy oligo DNA on the horizontal axis, the signal intensity on the vertical axis (IntDen) it is a depiction. As can be seen from Figure 2, when the addition ratio of dummy oligo DNA is eight times, are maintained the order relationship between the concentration and the signal intensity of the oligo DNA probes, and the signal intensity range also likewise order relationship is maintained wide it can be seen in comparison with the 1 times you are. Further, it can be seen that has stronger signal strength in accordance with generally probe concentration increases from FIG. Furthermore, when addition ratio the order relationship between the concentration and the signal intensity of the oligo DNA probe is maintained for 8 times, and the 1-fold each image when the concentration of oligo DNA probes of the image when the 0nM fluorescence to strength, several times the fluorescence intensity becomes stronger, to calculate the ratio shown (Figure 3). When the probe concentration is low, as in the example case of 1 nM, when RNA in situ hybridization signal is weak, the ratio indicates an increase in background noise. That is, when the addition ratio of dummy oligo DNA is 1-fold, the addition ratio is the ratio is greater than in eight times, it background noise is high seen from FIG. On the other hand, when the concentration of oligo DNA probes is high, the ratio indicates an increase in signal intensity by RNA in situ hybridization. When the addition ratio of 8 times, and the addition ratio is compared to the case of 1-fold, partial background noise is small, the signal strength of the entire image is low. However, as the concentration of oligo DNA probes increases, when the degree of increase in this ratio is the addition ratio of 8 times greater than the addition ratio is the when one fold, which is the dynamic range when the addition ratio of 8 times It shows the wide thing. From Figure 3, the dynamic range as compared with the addition when the ratio is 1 times when the addition ratio of 8 times it can be seen that has 1.375 times wider. The dummy oligo DNA and salmon sperm DNA, and without the addition of comparison of the effects of quantification of RNA in situ hybridization of an RNA detection were performed. In the experiment, mouse liver tissue samples formalin fixation and paraffin embedding as in Example 1, to create a serial sections were used in the experiment. Similar detection gene Example 1, using the single-stranded oligo DNA probes of the four shown in SEQ ID NO: 1-4 a and the both ends were FITC-labeled Cyp1a2, each concentration 0 nM (nanomolar four probe ), 1 nM, 2 nM, 3 nM, 4 nM, various of the 5nM to probe concentration, referred to as addition ratio 8 times the concentration in SEQ ID NO: 5 (L1C1) and SEQ ID NO: 6 (referred to as arbp) 2 type shown in the using dummy oligo DNA (single-stranded). Further, with respect to the same oligo DNA probe concentration, Invitrogen Corporation (Cat. No. 15632-011, Salmon Sperm DNA solution) with salmon sperm DNA, added to a final concentration of 100 ug / ml (micrograms / milliliter) (80 nM equivalent) did. As a control, without the addition of dummy oligo DNA or salmon sperm DNA (referred to as no addition) experiments were conducted. The detection of the FITC label, Dako Corp., anti-FITC rabbit polyclonal antibody, using P5100, tyramide-FLU (Perkin-Elmer Corp., TSA Plus Fluorescein System, NEL741B001KT) was performed TSA sensitization by. Figure 4 shows the in situ hybridization images obtained for the same area in serial sections. Shows an image of no addition from the top in this order, the image of the case of adding salmon sperm DNA, images in the case of adding L1C1 dummy oligo DNA, an image of the case of adding arbp dummy oligo DNA. The respective concentrations of the four oligo DNA probes from left to right 0 nM (nanomolar), a 1 nM, 2 nM, 3 nM, 4 nM, 5 nM. Images with a 10 × objective lens, the same region of the serial sections were taken using a Zeiss fluorescence microscope Axioplan2 and a CCD camera AxioCam. These images Image J software (NIH, http: //rsb.info.nih.gov/ij/) was treated computer was used to determine the signal intensity at each concentration. When the concentration of oligo DNA probes of 0 nM, signal intensity of the image is the fluorescence intensity of the background (IntDen), additive-free this, in the case of adding salmon sperm DNA, in the case of adding L1C1 and arbp dummy oligo DNA for shown in FIG. 5. The fluorescence intensity of the background is stronger than other in case of addition of salmon sperm DNA. Then, it was determined as the true signal intensity at each concentration by subtracting the fluorescence intensity of the background from the signal intensity at each concentration. This was shown in FIG. 6. If oligo DNA probe concentration was added arbp dummy oligo DNA at 1 nM, but the true signal intensity is smaller than the other, it is visible in high contrast signals, increase in background noise due to the addition of the oligo DNA probes shows that small. 6, if the true signal that was added L1C1 or arbp dummy oligo DNA, as 2.5 times 1.4 times as compared with the case when or no addition of adding salmon sperm DNA strong signal is obtained (especially Probe concentration when more than 2nM) can be seen. Further, upon addition of L1C1 dummy oligo DNA, and linearity between probe concentration and signal intensity upon addition of arbp it is very good it is seen. A comparison of the effects in the dummy oligo DNA and salmon sperm quantitative performance RNA in situ hybridization of RNA detection of DNA was carried out. In the experiment, mouse liver tissue samples formalin fixation and paraffin embedding as in Example 1, to create a serial sections were used in the experiment. Similar detection gene Example 1, using the single-stranded oligo DNA probes of the four shown in SEQ ID NO: 1-4 a and the both ends were FITC-labeled Cyp1a2, each concentration 0 nM (nanomolar four probe ), 1 nM, were used 2nM, 3nM, 4nM, for various oligo DNA probe concentration to be 5 nM, dummy oligo DNA shown in SEQ ID NO: 5 at a concentration of the additive ratio of 8 times (single-stranded). Further, with respect to the same probe concentration, Invitrogen Corporation (Cat. No. 15632-011, Salmon Sperm DNA solution) with salmon sperm DNA, final concentration was added to 100 ug / ml (micrograms / milliliter) (80 nM or equivalent). The detection of the FITC label, Daco Inc., anti-FITC rabbit polyclonal antibody, using P5100, tyramide-FLU (Perkin-Elmer Corp., TSA Plus Fluorescein System, NEL741B001KT) was carried out sensitization by. Figure 7 shows in situ hybridization images obtained for the same area in serial sections. Upper dummy oligo DNA addition of images, the lower part shows an image of the addition of salmon sperm DNA. The 1nM the respective concentrations of the four probes from the left (nanomolar), 2nM, 3nM, 4nM, is 5 nM. Images with a 10 × objective lens, the same region of the serial sections were taken using a Zeiss fluorescence microscope Axioplan2 and a CCD camera AxioCam. In these images to turn the noise region N where the signal region S and signal the signal is present does not exist as shown in FIG. 7, Image J software (NIH, http: //rsb.info.nih.gov / ij /) obtains the signal intensity in each region using the region S, the ratio of the signal intensity in N was determined as SN ratio (signal-to-noise ratio). Figure 8 shows on the ordinate the SN ratio obtained, the horizontal axis of the probe concentration, the comparison of the SN ratio of the case of adding the SN ratio and salmon sperm DNA in the case of adding dummy oligo DNA. As shown in FIG. 8, the relationship between oligo DNA probe concentration and SN ratio is a bell-shaped, that towards the dummy oligo DNA is good SN ratio as compared to salmon sperm DNA when oligo DNA probe concentration is more than 2nM It is shown. An embodiment in which to test the type and number of dummy oligo DNA sequences to be used. In the experiment, mouse liver tissue samples formalin fixation and paraffin embedding as in Example 1, to create a serial sections, deparaffinized treated with Protease K (Invitrogen, Proteinase K SOL. RNA, 25530049) after treatment , it was carried out the RNA in situ hybridization experiments. Similar detection gene Example 1, using the single-stranded oligo DNA probes of a and SEQ ID NO: 1 to 4 both ends were FITC-labeled Cyp1a2, the concentration of each of the four probe follows the results of Example 2 2 nM It was carried out under the conditions of (nanomolar). The dummy oligo DNA used in the experiment (single-stranded) has the sequence L1W1, L1W2, L1W3 (SEQ ID NO: 5, 7, 8) and sequences L1W1, L1W2, L1W3 (SEQ ID NO: 9-11) one (L1C1, L1C2 each one of L1C3, group ID = 1), one (L1W1, L1W2, respectively one L1W3, group ID = 2), 2 types mixed (L1C1 and mixing of L1W1, L1C2 and mixing L1W2, and L1C3 L1W3 mixture of, a group ID = 5), the mixing of the three mixing (L1C1, L1C2 and L1C3, group ID = 3), three mixed (L1W1, L1W2, mixing L1W3, group ID = 4), and six mixed It was carried out in the (group ID = 6). Incidentally, L1W1, L1W2, sequences of L1W3 has a respective L1W1, L1W2, L1W3 sequence complementary. The concentration of the dummy oligo DNA was performed with each in total 64 nM (8 times the total 8nM concentration 2nM of each oligo DNA probe). The detection of the FITC label, Dako Corp., anti-FITC rabbit polyclonal antibody, using P5100, tyramide-FLU (Perkin-Elmer Corp., TSA Plus Fluorescein System, NEL741B001KT) was carried out sensitization by. Images with a 10 × objective lens, the same region of the serial sections (the upper right of the number in each image indicates the order of the serial sections) were taken using a Zeiss fluorescence microscope Axioplan2 and a CCD camera AxioCam. Figure 9 shows the results of the RNA in situ hybridization. As shown in FIG. 9, although the dummy oligo DNA6 type where the mixing contrast is deteriorated as compared with the other, good images are acquired at any dummy oligo DNA combination. Next Image J software (NIH, http: //rsb.info.nih.gov/ij/) obtains the signal intensities of each image by using, as shown in FIG. 10 and Table 1. As shown in FIG. 10, no significant difference in signal intensity by the type and combination of the dummy oligo DNA used, good results are obtained. And a additive, increasing functional depending on the number of kinds of oligo nucleic acid probe N in the hybridization solution (theoretically in proportion) increases. In the experiment, mouse liver tissue samples formalin fixation and paraffin embedding as in Example 1, to create a serial sections, deparaffinized treated with Protease K (Invitrogen, Proteinase K SOL. RNA, 25530049) after treatment , it was carried out the RNA in situ hybridization experiments. Similar detection gene Example 1, using the single-stranded oligo DNA probes of a and SEQ ID NO: 1 to 4 both ends were FITC-labeled Cyp1a2, the respective concentrations of the four oligo DNA probes with 2 nM (nanomolar), oligo DNA probes 1, 2, 3 were carried out in conditions that do not put four conditions and oligo DNA probes. The dummy oligo DNA (single-stranded), using the dummy oligo DNA of SEQ ID NO: 5 (L1C1), concentration was carried out at 8 times the total concentration of the oligo DNA probe used. That is, 1 when the type of oligo DNA probes, a 64nM when 16 nM, 2 kinds of 32nM when oligo DNA probes, three 48nM when oligo DNA probes, four oligo DNA probes. In addition, the concentration of the dummy oligo DNA and 64nM in the conditions oligo DNA probe is not. The detection of the FITC label, Dako Corp., anti-FITC rabbit polyclonal antibody, using P5100, tyramide-FLU (Perkin-Elmer Corp., TSA Plus Fluorescein System, NEL741B001KT) was carried out sensitization by. Images with a 10 × objective lens, the same region of the serial sections were taken using a Zeiss fluorescence microscope Axioplan2 and a CCD camera AxioCam. It shows an image in Figure 11. Next Image J software (NIH, http: //rsb.info.nih.gov/ij/) determined once the signal intensity of each image using the image at those from does not contain oligo DNA probes conditions the less the signal intensity values ​​was determined as the signal strength at each probe type number of images. The results are shown by plotting the signal intensity and the vertical axis in FIG. 12, the horizontal axis the number of types of oligo DNA probes. As shown in the figure, the case of adding dummy oligo DNA, the number of types and signal intensity of the oligo DNA probes glue straight clean right up, are in a linear relationship. Signal intensity according to the concentration increases oligo DNA probe used for detection, how changing or shows. Comprising concentrations of the equilibrium constant and Haizuridaizu the product [H], relationship between the concentration of the free mRNA concentration [fR] and of free oligo DNA probe [fP] is true. Since two expressions is satisfied, the higher the concentration of oligo DNA probes to hybridize, Haizuridaizu the product is increased. In this embodiment, in accordance with the concentration of oligo DNA probes increases, indicating that the signal intensity becomes linearly strong. In the experiment, mouse liver tissue samples formalin fixation and paraffin embedding as in Example 1, to create a serial sections, deparaffinized treated with Protease K (Invitrogen, Proteinase K SOL. RNA, 25530049) after treatment , it was carried out the RNA in situ hybridization experiments. Detection gene using single-stranded oligo DNA probes of SEQ ID NO: 12 at both ends is albumin Alb and FITC labeled, 0 nM (no probe), 0.1nM, 0.25nM, 0.5nM, 1nM, six of 1.5nM concentration in was carried out. The dummy oligo DNA, using the dummy oligo DNA of SEQ ID NO: 5 (single-stranded), concentration was carried out at 8 times the concentration of the oligo DNA probe used. The hybridization solution which does not contain the oligo DNA probe, using the dummy oligo DNA of 12nM. The detection of the FITC label, Dako Corp., anti-FITC rabbit polyclonal antibody, using P5100, tyramide-FLU (Perkin-Elmer Corp., TSA Plus Fluorescein System, NEL741B001KT) was carried out sensitization by. Images with a 10 × objective lens and 20 times, the same region of the serial sections were taken using a Zeiss fluorescence microscope Axioplan2 and a CCD camera AxioCam. It shows the image in FIG. 13 (upper part 10 × objective lens, the lower is the objective lens 20-fold image). Further, Image J software (NIH, http: //rsb.info.nih.gov/ij/) was used to determine the signal intensity of the image at each concentration in the computer, the concentration of oligo DNA probes of 0nM image the value obtained by subtracting the signal intensity in was determined as the true signal intensity. The results in Figure 14, the signal intensity on the vertical axis, shown by plotting probe concentration on the horizontal axis (Figure 14a the signal intensity with respect to the objective lens 10 times the image of FIG. 13, FIG. 14b is an objective lens of Fig. 13 20 signal intensities for multiple images). As shown in Figure, it becomes stronger linearly signal strength in accordance with a probe concentration increases (in the case of Alb gene as shown in FIG. 14, 1 nM) is the concentration above from the signal intensity is saturated It is shown. This expression level in the liver of Alb gene to indicate the results of quantitative PCR in Example 9 reflects the very high. Signal intensities according to the concentration of probe increases used to detect, how changing or shows. In the experiment, mouse liver tissue samples formalin fixation and paraffin embedding as in Example 1, to create a serial sections, deparaffinized treated with Protease K (Invitrogen, Proteinase K SOL. RNA, 25530049) after treatment , it was carried out the RNA in situ hybridization experiments. Similarly the detection gene Examples 1, 2, using the single-stranded oligo DNA probes of a and SEQ ID NO: 1 to 4 both ends were FITC-labeled Cyp1a2, 4 kinds of each concentration of oligo DNA probes 0 nM (nanomolar) , 1 nM, were used 2nM, 3nM, 4nM, relative concentrations of various oligo DNA probe comprising a 5 nM, dummy oligo DNA shown in SEQ ID NO: 5 at a concentration of the additive ratio of 8 times (single-stranded). The hybridization solution which does not contain the oligo DNA probe, using the dummy oligo DNA of 64nM. The detection of the FITC label, Dako Corp., anti-FITC rabbit polyclonal antibody, using P5100, tyramide-FLU (Perkin-Elmer Corp., TSA Plus Fluorescein System, NEL741B001KT) was carried out sensitization by. Images with a 10 × objective lens, the same area three locations of serial sections were taken using a Zeiss fluorescence microscope Axioplan2 and a CCD camera AxioCam. It shows an image in Figure 15. Further, Image J software (NIH, http: //rsb.info.nih.gov/ij/) was used to determined by the signal strength calculator image of each region at each concentration, the image probe concentration is 0nM the value obtained by subtracting the signal intensity was calculated as the true signal intensity in, to obtain an average value of the three locations. The results in Figure 16, the signal intensity on the vertical axis, shown by plotting probe concentration on the horizontal axis. As shown in Figure, it is linearly signal intensity also is a strong indication accordance probe concentration under the dummy oligo DNA addition increases. By relation expression level and signal intensity is linear, an example showing that the RNA in situ hybridization with the present invention can quantitatively detect target gene mRNA. In Arntl varying expression level in accordance with detected gene circadian cycle in this embodiment, using 8-week-old male mice, in five points every 4 hours from 9 AM to 1am (at 25), 2 individuals each were collected target tissue of the liver (outside left lobe) was cleaved in half, the ranges of both sides 2mm from the cut surface, the tissue for RNA extraction for subjecting the tissue sample and quantitative PCR for embedding formalin-fixed, paraffin It was used as a sample. Tissue samples were prepared by embedding also formalin fixed-paraffin as in Example 1, to create a serial sections, deparaffinized treated with Protease K (Invitrogen, Proteinase K SOL. RNA, 25530049) after treatment, RNA in situ high the hybridization experiments were performed. Oligo nucleic acid probe detection gene Arntl is used across the Dig labeled SEQ ID NO: 13 and 14 (distance on the mRNA of Arntl gene 21 bases) single-stranded oligo DNA probes at each concentration 2 nM (nanomolar) did. Dummy oligo DNA (single-stranded) was used at a concentration of L1C1 addition ratio 8x shown in SEQ ID NO: 5. The detection of Dig label, anti Dig antibody (Roche, anti-digoxigenin -POD, 1207733) using, in the TSA sensitization a tyramide-Cy3 were used (Perkin-Elmer, TSA Plus Cyanine 3 System, NEL744B001KT) a. Images with a 10 × objective lens, were taken with a Zeiss fluorescence microscope Axioplan2 and a CCD camera AxioCam. It shows the images of two areas in the liver of one individual each time point in FIG. 17. Further, Image J software (NIH, http: //rsb.info.nih.gov/ij/) was used to determine the signal intensity of the image at each time by the computer, a comparison of the amount expressed by quantitative PCR went. Quantitative expression levels of by quantitative PCR of Arntl gene mRNA, using primers forward and reverse, shown in SEQ ID NO: 15 and 16, was carried out quantitative PCR with TaqMan method. The arrangement of the TaqMan probe is shown in SEQ ID NO: 17. In addition, it simultaneously Actb quantitative PCR an internal standard gene (PCR primers and TaqMan probes for Actb is purchased from Applied Biosystems). Incidentally, quantitative PCR using the Applied Biosystems 7500 Reat-time PCR System, was performed in accordance with the accompanying protocol thereto. For tissue samples taken changes in the target gene Arntl and Actb expression level every four hours 18, shown as a change in Ct values ​​determined by quantitative PCR. Figure 19, shows changes in signal intensity determined by the RNA in situ hybridization of the target gene ARNTL. Further, by plotting the mean value of each time a group of Ct values ​​and signal intensities determined by RNA in situ hybridization was determined by quantitative PCR of the target gene Arntl in harvested livers of each individual Figure 20, Ct by quantitative PCR It shows the relationship between the signal intensity by value and RNA in situ hybridization. As shown in FIG. 20, under the dummy oligo DNA addition, Ct value and the signal intensity of the quantitative PCR, the Ct value is smaller when the expression level of which shows a good correlation (mRNA often, the Ct value ordinate, when taking a signal intensity on the horizontal axis, the correlation downward sloping as shown in this figure). Using male mice one individual liver 8 weeks old at 1:00 pm used in Example 8 as a tissue sample, both ends using oligo DNA probes labeled with Dig to the target gene Cyp1a2, for the target gene Alb both ends conducted TSA sensitization in multiple stages using oligo DNA probes labeled with FITC, the two target genes quantitatively detected in two colors of fluorescent dyes, compared with Ct values ​​by quantitative PCR for these genes an embodiment in which the. Quantitative expression levels of by quantitative PCR of Cyp1a2 gene mRNA, using primers forward and reverse, shown in SEQ ID NO: 18 and 19, was carried out quantitative PCR with TaqMan method. The arrangement of the TaqMan probe is shown in SEQ ID NO: 20. 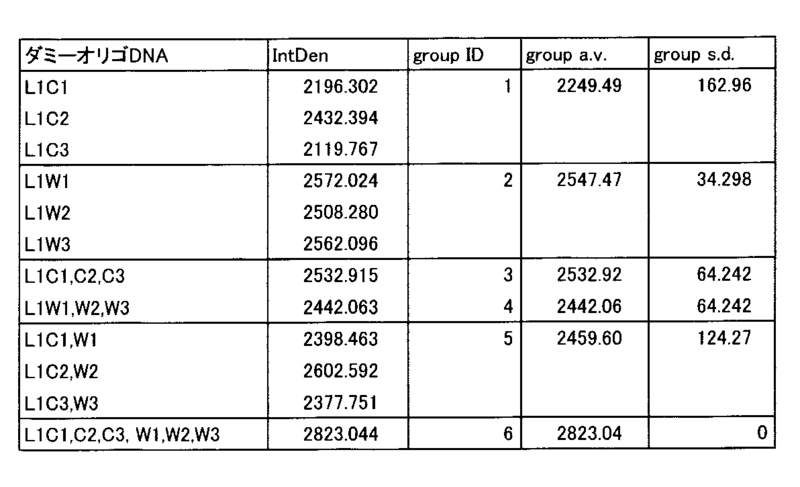 Quantitative expression levels of by quantitative PCR of Alb gene mRNA, using primers forward and reverse, shown in SEQ ID NO: 21 and 22, was carried out quantitative PCR with TaqMan method. The arrangement of the TaqMan probe is shown in SEQ ID NO: 23. Incidentally, quantitative PCR using the Applied Biosystems 7500 Reat-time PCR System, was performed in accordance with the accompanying protocol thereto. Ct values ​​of Alb gene 22.135 (amplification efficiency 1.0178), Ct values ​​of Cyp1a2 gene 27.053 (amplification efficiency 1.0008), and 5 th power i.e. 128 times the approximately 2, it was shown that in many cases the expression levels of Alb gene . Oligo DNA probe used was a probe one shown at both ends Dig label oligo DNA probes five (SEQ ID NO: 2 and 24 to the probe shown in 27 pairs) or SEQ ID NO: 2 to Cyp1a2 gene, using oligo DNA probes of two shown across FITC label of SEQ ID NO: 12 and 28 to Alb gene. Further, using the L1C1 represented by SEQ ID NO: 5 to the dummy oligo DNA. In the experiment, after the mouse liver usually formalin-fixed, paraffin-embedded, create a serial sections, deparaffinized treated with Protease K (Invitrogen, Proteinase K SOL. RNA, 25530049) after treatment with a mix char of the probe It was performed RNA in situ hybridization using. The detection of Dig label, anti Dig antibody (Roche, anti-digoxigenin -POD, 1207733) using, in the TSA sensitization a tyramide-Cy3 were used (Perkin-Elmer, TSA Plus Cyanine 3 System, NEL744B001KT) a. Further, FITC for detection of the label anti-FITC antibodies (Dako Corporation, anti-FITC rabbit polyclonal antibody, P5100) using, in the sensitization TSA a tyramide-FLU was used (Perkin-Elmer, TSA Plus Fluorescein System, NEL741B001KT) a . Incidentally, using a Zeiss fluorescence microscope Axioplan2 and a CCD camera AxioCam at 10 × objective lens in the microscope image taking. Results of quantitative PCR, Cyp1a2 gene was found to be not expressed only about one 128 minutes of Alb gene. Using two serial sections 19, the same sections Cyp1a2 gene mRNA detected by Cy3, an example of detecting the Alb gene mRNA in FLU. The upper part of FIG. 21 is a result when (section 1) using only one probe for the detection of Cyp1a2 gene, and the lower shows the in situ hybridization images when using a set of five probes (section 2). As shown, unlike the localization of the expression of two genes, Alb gene is expressed in PV (portal vein) region, Cyp1a2 gene is expressed in CV (central vein) region. Further relates to the detection of Cyp1a2 gene mRNA, when the number of probe 1, but the signal is very weak, in the case where the number of probes to 5, the signal intensity is close to the signal intensity by FLU of Alb gene mRNA. That is, as a result of the quantitative PCR as described above, Cyp1a2 gene is not expressed only about one 128 minutes of Alb gene, by increasing the number of types of probes, fill the difference in the expression level of 2 th power of 10 It has succeeded in increasing the signal strength Te. This, by using the Image J in the image of FIG. 21, sections 1, for each of the sections 2, PV region, set eight respective circular small areas of a size shown in FIG. 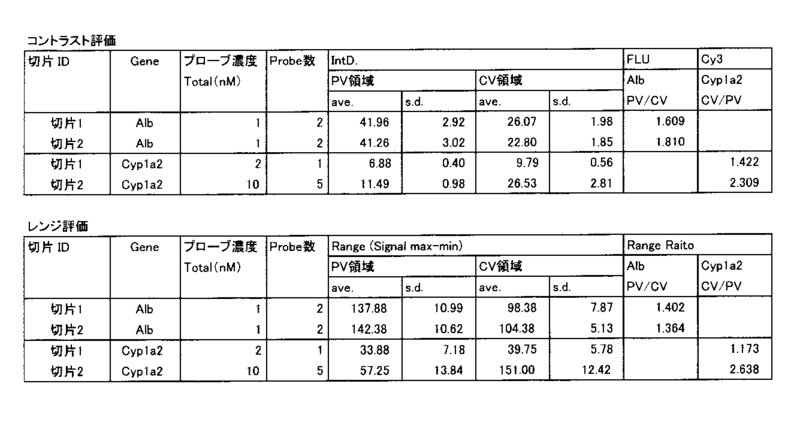 21 in the CV region, signal FLU the signal intensity of the intensity and Cy3 were measured and summarized in Table 2. Maximum signal intensity of Cy3 as in the section CV region range evaluation in Table 2 is an oligo DNA probes five at the oligo DNA probes one 39.75 for Cyp1a2 enhanced in 151.00, the maximum signal intensity in PV region of Alb ( sections 1 at 137.88, comparable to in sections 2 142.38). As in this embodiment, the dummy under oligo DNA addition, the plurality of target genes, by adjusting the number and concentration of the oligo DNA probe used, the square-10 expression level of a target gene 10 be different 3 th power, it is possible to adjust the signal strength to the same extent. In mouse liver, albumin (Alb) oligo DNA probes (SEQ ID NO: 12, both end FITC-labeled, concentration 1 nM) to gene using, tyramid-FLU in tyramide sensitivity amplification (Perkin-Elmer Corp., TSA Plus Fluorescein System, NEL741B001KT) of We saw the effect of the concentration. In the experiment, after the mouse liver usually formalin-fixed, paraffin-embedded, create a serial sections, protease K (Invitrogen Corp., Proteinase K SOL. RNA, 25530049) was treated with the label of the oligo DNA probe and SEQ ID NO: 29 rats Actb gene of oligo DNA that have not been added to and used at a concentration 8nM as the dummy oligo DNA, was RNA in situ hybridization. The detection of the FITC label, Dako Corp., anti-FITC rabbit polyclonal antibody was used P5100. The results are shown in Figure 22. Dilution 1 in the drawing, at a concentration of tryamide-FLU recommended by the manufacturer protocol, 2-fold dilutions, 5-fold dilution experiments were conducted in 10-fold dilutions. As shown in FIG. 22, in accordance with decreasing the concentration of tryamide-FLU, also reduced signal intensity. Incidentally, using a Zeiss fluorescence microscope Axioplan2 and a CCD camera AxioCam at 10 × objective lens to the microscope imaging, each image obtained treated with Image J, was determined signal intensity. From the 5 'end of the mRNA sequence of the rat GAPDH gene, while shifting one nucleotide at a time the length of the window (40 bases in this example) to be used as oligo-nucleic acid probe, an example of calculation of the GC content of each oligo nucleic acid (%) Figure 23 shows. When oligonucleic acid probes, and adds a label to the probe, or providing how affect the hybridization depending on the position and the number of labels to add labels, in situ hybridization of the signal for the rat actin beta gene Actb in rat lungs It was confirmed by the intensity (Figure 24). That is, after rat lung of normal formalin-fixed, paraffin-embedded, create a serial sections, deparaffinized and Protease K (Invitrogen Corp., Proteinase K SOL. RNA, 25530049) after treatment with the FITC-labeled 5 'end added oligo DNA probes (probe 1), 3 'end added oligo DNA probes (probe 2), 5' and 3 'of the FITC-labeled at both ends of the endcapping oligo DNA probes (probe 3) use performed RNA in situ hybridization, the resulting fluorescence intensities were compared. In this embodiment, using the dummy oligo DNA rather than salmon sperm DNA. Wherein the sequence of the added three oligo DNA probe FITC-labeled using is the length 40 bases the same are shown in SEQ ID NO: 29. Experimentally, proteins POD has been linked to the anti-FITC antibody for detecting FITC-labeled (Dako Corp., anti-FITC rabbit polyclonal antibody, P5100) to detect the FITC using, was further added a tyramide-FLU, TSA It was carried out sensitization. The TSA sensitization using a Perkin-Elmer's kit (TSA Plus Fluorescein System, NEL741B001KT), TSA sensitization of the protocol was carried out according to the accompanying text of this kit. The concentration of probes to be hybridized are both set to 5 nM. Using a Zeiss fluorescence microscope Axioplan2 and a CCD camera AxioCam at 10 × objective lens for photographing. Figure 24a, b, c, the probe 1, respectively, the probe 2, a result of detection of the mRNA of the Actb gene in rat lung by the probe 3. 5 'end only the signal intensity of the mRNA of the Actb gene detected by probe 1 labeled and, 3' signal intensity of the mRNA of the Actb gene detected by the added probe second end only label substantially equal Met. Moreover, signal intensity of the mRNA of the Actb gene detected by the added probe 3 labeled at both ends were these fold about. That is, the signal intensity is dependent on the number of labels, the use of additional probes labeled at both ends, it is possible to increase the detection sensitivity. The arrangement of the Actb sense probe shown in FIG. 24d is a complement of SEQ ID NO: 29. On mRNA of a single gene, when trying to detect a hybridized product using more than one label on the mRNA of the nucleic acid sequence, two or labels have to be exactly How far were confirmed. This sensitization method or using microscopy labels, but also on the resolution of the optical system of the CCD camera. In this embodiment, with respect to the nucleic acid sequence of mRNA of a gene GAPDH, provides two oligonucleic acid probes A1 and A2, the 5 'end and the 3' end of A2 'of A1 was labeled with FITC (Fig. 25). The length of the added A1 and A2 of the label is 40 bases, 3 A2 'end, 5 of A1 shown in SEQ ID NO: 30' 3 bases from the end, 5 bases, 8 bases, at a distance of 11 bases so as using four kinds of probes A21, A22, A23, A24 (SEQ ID NO: 31, 32, 33, 34). In sample tissues rat lung was used, after usual formalin fixation and paraffin embedding, create a serial sections, protease K (Invitrogen Corp., Proteinase K SOL. RNA, 25530049) after treatment, of the probe pairs ( A1 and A21, A1 and A22, A1 and A23, A1 and A24), and salmon sperm DNA were performed RNA in situ hybridization using a. FITC of Dako, Inc. in the detection, anti-FITC rabbit polyclonal antibody, using the P5100, was TSA sensitization using a Perkin-Elmer's kit (TSA Plus Fluorescein System, NEL741B001KT) for sensitization. Using a Zeiss fluorescence microscope Axioplan2 and a CCD camera AxioCam at 10 × objective lens in the microscope image taking. As shown in FIG. 26, when the 3-terminal distance '5 end and A2' of A1 is away 8 bases or more, additive enhancement of signal is observed. That is, the distance between the label is a condition that apart 8 bases. To the mRNA of the rat ACTB gene, the oligo nucleic acid probe of the length 40 bases labeled at both ends with FITC, GC content of 40% (SEQ ID NO: 35), 50% (SEQ ID NO: 29), 60% (SEQ ID NO: 36), using the four kinds of 70% (SEQ ID NO: 37), respectively used as a probe alone performs RNA in situ hybridization in rat lung, furthermore, anti-FITC antibodies (Dako Corporation, anti-FITC rabbit polyclonal antibody , sensitization TSA using the P5100) (Perkin-Elmer Corp., TSA plus fluorescein system, NEL741B001KT) was carried out. The microscope imaging using a Zeiss fluorescence microscope Axioplan2 and a CCD camera AxioCam at 10 × objective lens (Fig. 27). According GC content of the probe is increased, the signal is strong, it can be seen that the detection sensitivity is increased. In other words, since the equilibrium constant K and melting temperature Tm of the hybridization is an increasing function of the GC content in accordance with the melting temperature Tm is increased, the signal intensity increases, the detection sensitivity is increased. The arrangement of the Actb sense probe in FIG. 27 is a complement of SEQ ID NO: 29. It can also be used as the dummy oligo DNA. In the example of the dummy oligo nucleic acid of the SEQ ID NO: 38, which is the same as the length and GC content oligo DNA probes (SEQ ID NO: 27). RNA in situ hybridization method, characterized in that. The dummy oligonucleic acid amount, RNA in situ hybridization method of claim 1 which is 2 to 10 times the oligo nucleic acid probe amount. RNA in situ hybridization method of claim 2 is substantially the same in the range base long oligonucleic acid probes and the dummy oligonucleic acid of 70bp from 20 bp. Oligo nucleic acid probe, the 5 'end base and / or 3' RNA in situ hybridization method of claim 1 where the low molecular compound label is added to each of the terminal base. RNA in situ hybridization method of claim 1 hybridizes to the mRNA to the two or more leaves and the 5 'and 3' ends of one another 8 bases or more oligonucleic acid probes of claim 4. RNA in situ hybridization method of claim 1 for detecting the signal from the 10-fold using a 40 × objective lens. Tissue sample is a tissue isolated from mammal, RNA in situ hybridization method of claim 1 dummy oligo nucleic acid is oligo nucleic acid consisting of a part sequence of the repeated sequences of retrotransposon. Tissue sample is a tissue isolated from mammal, RNA in situ hybridization method of claim 1 dummy oligo nucleic acid is oligo nucleic acid consisting of a part sequence of a portion or microbial genome of a plant genome. RNA in situ hybridization method of claim 1 wherein the oligo nucleic acids obtained by. A dummy oligo nucleic acid for use in RNA in situ hybridization method of claim 7, oligo-nucleic acid comprises a portion sequence of repeated sequences of retrotransposon or more consisting of different partial sequence of the repeat sequence, set of oligo nucleic acid. According a dummy oligo nucleic acid for use in RNA in situ hybridization method according to claim 8, different part sequence of the oligonucleotide nucleic acid or a plant genome or a microorganism genome, consisting of some sequences of some or microbial genome of a plant genome set of a plurality of types of oligo nucleic acid consisting of.